Posted by Outis Philalithopoulos, who in life was an economist, and now, as a ghost, watches fascinated as ever stranger events flit through the world of mortals. Certain stories that get virtually no traction nevertheless involve phenomena that are quite important in understanding the way the world operates. One instance is the network of secrecy jurisdictions (“tax havens”), which play a huge role in the global economy by providing back channels used by a substantial fraction of the world’s wealth. For those interested in the details, one good place to start is Nicholas Shaxson’s 2010 book Treasure Islands. Originally posted at the Tax Justice Network. We’ve periodically remarkedon the Bahamas as a secrecy jurisdiction of great concern. 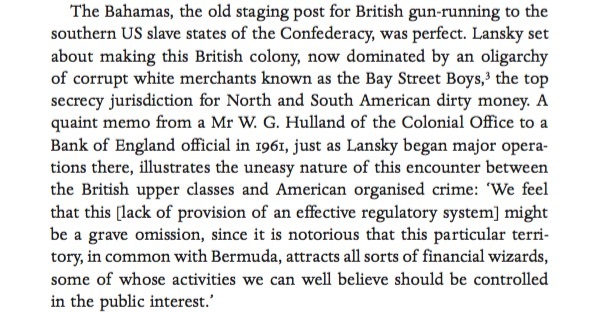 Like Panama, it’s generally had a greater tolerance of dirty money than most modern offshore centres: more of a willingness to turn a blind eye and to overlook noncompliance by Bahamas-based actors of its own rules and laws. The key to understanding WHY the Bahamas and other offshore banking centers remain in business can be seen from looking at the Treasury Bulletin’s quarterly reports on these enclaves. Look for “US Bank liabilities to …” and you’ll see that the hot money that goes there is deposited in branches of US banks, which send them to their US head offices. Then, look at US Treasury, ownership of U.S. Government securities, and see how many are held in these islands. The hot money ends up in the US. They are a major support of the dollar’s exchange rate. These jurisdictions are the product of existing tax regimes…….. Were income tax on corporations replaced with a goods and services tax (value added) which taxed imported goods on full landed value, including transportation costs, offshore markups would cease. Eliminating the war on drugs, would eliminate the rest. We had an income tax system that took care of the “value added” issue in place for many years. It taxed corporations just like U.S. citizens (on all world income). It was simple and effective. It was only changed when the neoliberals took over the asylum. Now corporations are able to transfer income and it’s consequent taxation as if they are a citizen of no country but on the other hand can use their money to control our government. We have gone from taxation without representation to representation without taxation – what could go wrong? I might add that legalizing drugs would cause the money laundering issue to die of natural causes. The war on drugs is Prohibition v.2. People have rights and also responsibilities. They want to destroy their lives, it should only concern us when they destroy ours too. With drugs illegal, the negative impact on those who don’t partake is not worth the cost. ^That.^ It would also make purities known, lessen overdoses, lessen the stigma of addiction and treatment, and pull the plug on funding for organized crime. There’s certainly a logic to it, and the ‘war and drugs’ has been about as successful as the wars in the Middle East. But how do you envision this working? Do Bayer and Merck starting producing and selling heroin, meth and cocaine? Does the FDA certify safety and proper dosage? Are the drugs sold OTC or does one need a doctor’s script? Or are they available only at government dispensaries? Are they covered by insurance, or are they free? I’m not being snarky. I want to understand how it would work. If you have a good link on the subject, I’d love to read it. Mike – Only in perfect world do you have none of these issues to deal with. Drugs are another person’s choice from alcohol. Doctors tell me that Xanax works on the brain in a similar way to alcohol. People take drugs because throughout history they make it easier to get through the day. People abuse alcohol and must be treated. People abuse drugs and are jailed. Why? Understand that the problems will occur as part of the human condition and provide the best means to treat those in need. That is the issue. As far as how they are marketed and regulated, it is fair to say that if we can’t come up with a better way than now we are getting what we deserve. The entire idea of “legalization” would mean that no drugs would need to be prescribed (i.e. it would not be illegal to buy any of them). Obviously, smarter people would stay clear of drugs that “should” be prescribed by physicians, but how would the common person know which ones they should “not” take w/o doctor’s recommendation? This would cause major problems in society. Any suggestion of legalizing all drugs should have to refer to Aden and Kat. Actually everybody is correct in this discussion. Its a complex topic because human nature is complex. I would like to state my qualifications and position up front: I am a survivor, and an addiction counsellor. I deal with this stuff in real life, I see it up close and personal all the time. And IMHO, all forms of addiction (not just drugs) have a profound negative effect on society at large, and the individuals immediate family. Yes, I include the kleptocrats, oligarchs, etc etc in the list of addicts… because its never enough for them. Thus there is no way to have an addiction without it costing others around you. IMHO gov’t efforts tend to fail because they tend to address symptoms of deeper causes and conditions. My own approach is a blend of psychological/spiritual and practical day-to-day living techniques which are designed to rebuild and strengthen the individual. Decent success rates, too, far above average. These problems have grown incrementally and will only be reversed incrementally. I commend you for doing your part. It is a well documented fact that prison exacerbates the problems that led to incarceration and very rarely lead to improving the prisoner’s contributions to himself his family and society. Robert – I respectfully disagree with your conclusions. Making the use of drugs a medical issue instead of a criminal issue will lessen the impacts felt by the large criminal enterprise that now exists. That is the issue. Treating alcoholics is the preferred method as opposed to jailing them. Also, the availability of certain illegal drugs affects consumption patterns. All drugs do not have to be legalized in order to substantially reduce the criminal enterprise which currently exists. Drugs can be broken down into categories as to the effect which is brought about, and those that are the most harmful can be made illegal. Just because beer and gin are legal does not mean that certain beverages labeled “beer” and “gin” can legally be sold. So to is it with drugs. Nothing is perfect and with all due respect, your arguments are in the category of, if the alternative is not perfect it is de facto not an improvement on what we have. I disagree. In the interests of full disclosure, I am a retired CPA with no connections to law enforcement, past or present. What say you? In my post, I did not say that I favor the status quo. I said that all such discussions need to acknowledge that legalizing drugs will have negative consequences. Are those consequences less than what we are currently doing? Probably. However, they are not trivial. Meanwhile, legalizing some of the less-potent narcotics, preferably with at least a few caveats might be a major boon to society (as the Portugal example suggests). The US is not Portugal, and we likely have more people who came from dysfunctional families (in the past–maybe also today). This might make our experience with legalization more difficult. I was a pharmaceutical chemist before I became disabled (for whatever credentials–personally I find the arguments more compelling than someone’s credentials–but for disclosure sake). Legalizing drugs does not have to mean they would be totally unregulated. Heroin could be legal but controlled, for example. (BTW big pharma still manufactures cocaine, which does have medical uses). If the USA really cares about drug abuse there should be treatment centers everywhere. Portugal legalized all drugs a few years ago, and have seen a lot of drug-related problems diminish or disappear as a result. The police there are happy. Interesting link, thank you. However, it seems Portugal didn’t really change treatment of the supply side of the question, which sounds like it’s still illegal, and still being prosecuted — hence still a ‘mob’ business with its dark pools of capital. At least that’s what I understood from the article. Solar – I mean no offense but are you suggesting that we are better to wait for someone else to be a guinea pig? I would like to think that we could provide leadership on something as important as this. Looks like we’re all presently waiting for someone else to make the first attempt. If the WoD ever has a sunset, and I wouldn’t hold my breath on that, it’s to lucrative for all parties involved, I would not expect a cessation of money laundering. I did not mean to disagree with Dr. Oprisko but merely wanted to pointed that we had a means to deter transferring the taxation of value added out of the US. That said, there is an even simpler way to fix the problem – a national sales tax. The people can accumulate all the money they want but when they use it they pay tax. Apply a very small percentage to EVERY time money changes hands and the problem disappears. Many years ago I became acquainted with an attorney who tried to create interest in this approach. At that time he calculated that if such a tax were instituted a mere 4 percent rate would eliminate every tax on the books at that time. I wonder how many large transactions would have a substantial % go off book? A fair question. Doing business with actual cash is the only way that can happen and you are correct that it would be difficult to monitor, Eliminating cheating is impossible however. It’s is always and everywhere a case of managing it. I want to add there is credible evidence that one of the largest money laundering operations is American tobacco companies. Enormous quantities of cigarettes are purchased with cash and efforts to compel reporting of who the purchasers are have been successfully quashed by lobbyists and the tobacco companies themselves. To Whine Country’s comment, one could add that before the US income tax of 1913, financial privacy was considered a hallmark of civilization. Your finances were a private matter between you, your banker and your attorney. Government had no interest in demanding disclosure of your bank accounts, since it collected revenues from excise tax, property tax and customs duties. That’s a personal value judgment of the Facebook/Snapchat/Instagram generation, which we are not obliged to share. We need not worship our plunderers. Yeah, that privacy is very special to those who loot. Of course. But then people who prosper under the Regime of Bezzle do not give a scoot what happens to other people who are looted and abused by Holy Unregulated Business, right? “Sauve qui peut,” and all that. Eat what you kill or can steal. I did all the hallucinogenics & like Psylicibin the best. Forgive me I don’t feel like looking it up. At any rate the opioids have all been by prescription because of important chronic pain. It would be otherwise “disabling” pain, as I have been there. So I says that for pot it is 24 hours joint to joystick, and three days if you eat hashish, which I have done. Far as muscle memory and motor skills there is no diminished ability. For either. However you will get lost. The Drug War kills and pot as prohibited shows how Joe Mcarthy and J. Edgar Hoover run our lives domestically. A sick situation of corrupt interests topped by the For Profit Prison System. The Intelligence Community Front Businesses have a strong interest in joining the criminals at the bank in the Bahamas, or Panama, or Singapore. I personally am concerned about the Fronts of the CIA & MI6. IN-Q-TEL is of interest same as its friend American Airlines. How CIA Front Businesses get Treasury Dollars and then take care of themselves first, imitating the disloyal habits of the Jet Setters is cause to burn. I know that DARPA has made exoskeletons with their money, but because it is only for the tank cannon carousel loader, or Red Ball Express loads on Duece & a half stake backs, our chicken head chop and cut workers are tortured, along with sheetrock movers who suffer 70 percent disability. There really are good reasons that all is not accounted for, but they are few and there must be even a wise checklist for the wise. Such was the end of Rome. So, you try to close a hole while another one enlarges or arises. The same old story. For the sake of clarity I would highligth from the very beginning that the CRS is NOT being implemented or pushed by the OECD, but by de OECD-EXCEPT THE US. This waters down the potential impact of the initiative from the very beginning. I read this paragraph and, well , it sound fishy. I look into the document and, as I suspected, there is another little little tax haven that has not signed: the United States (which was the building which has that many corporations…). I do not remember where I read (possibly here in NC) that one way to look at Panama papers is as a way the US found to fight the competition for the dirty money. Make no mistake: this is a giant, fist-pumping Screw-You to the civilised world. The Bahamas is loudly advertising its desire to take criminal money. And, as mentioned, they’re aggressively sending delegations out to places like Mexico and Colombia, which are suffering terrible violence and murder because of their drugs wars, and advertising an open shop to the drugs cartels. I have to say, I don’t really care. The reason the cartels exist is because drugs are on a black market. Eliminate the black market and you won’t have cartels, you’ll have small businesses operating in that market. Or, let’s take other black markets, like arms trade. Gun runners export their weapons to warzones, because who else needs tons and tons of arms? Well, looking at the world’s biggest conflict zones, the top three are US-funded quagmires (Afghanistan, Iraq, Syria). All preventable. Not to mention the connection between US occupation/destabilization of Afghanistan and the opium trade. If a country wants to be the black market banking haven, I think you use what pressure you can to stop them, and that’s all you can do. Best way to defund the Bahamas, Singapore, whatever shady practices? Stop the foreign and domestic policies that create demand fulfilled by black markets. At that point, the Bahamas will be used to launder money in above-ground markets, which they’ll find much less lucrative. Very interesting thought exercise; look at tax havens another way in that all the rich people/governments in the world need a place to stash their cash. Tax Havens are necessary to facilitate corruption. So the rich need tax havens, but they also need to show the public “they are doing something” about it without actually doing anything. But I think your idea aims to tackle this problem at the source. Its clearly not the American way to solve things (i.e. we do the right thing only after exhausting all other options). Until enough people understand what you describe, the problems will only worsen. Correct root cause analysis which will never be formally recognized. In your example, if the black market for weapons was ever seriously addressed it would systemically strangle the ROI of many of the institutionalized weapons (and countermeasures) manufacturers. As well, the WoD feeds a massive edifice of bureaucracies -both on the production/distribution dide as well as on the interdiction/prosecution/incarceration side. Hugely systemic threads throughout the world’s economies. At least with the drug trade there’s a possibility for change, but it is obvious that our overlords are pro-arms trade. When it comes to the world’s elites, I would guess that in many cases there is a nexus of great wealth and great crimes. It should be fairly trivial to hide a chip in weapons that would allow them to be traced or monitored but the chances of that actually happening are probably zero. There is just too much money to be made. Blest paper credit! last and best supply! Or ship off senates to a distant shore. Splendid to see Pope quoted! Pope’s satirical, elegant rage is apt for our times. ..’is famed…’ or ‘…was famed…’. Are you referring to the person (was famed, since he is deceased) or the ghost (is famed) which is presumably ‘alive’ and in the present time. I argue for the deceased version, since I am not familar with the ghost; am a scholar of the economist, outis philalithopoulos (google and see this man’s work – yes, the singular form). The system, matters. There are “Best Practices”. The Fronts of the Intelligence community would appear to have strong interests in untraceable secret funds.